I have always been dubious of electric taxicabs. Of course, I understand the logic behind them, but I also know that cabbies put on a lot of miles. That mileage is also unpredictable, as cabbies never know in advance where the next customer will want to go. With the low range of an EV, few people would think of an electric taxicab as a viable proposition, and I don’t but there’s at least one person convinced in Munich. 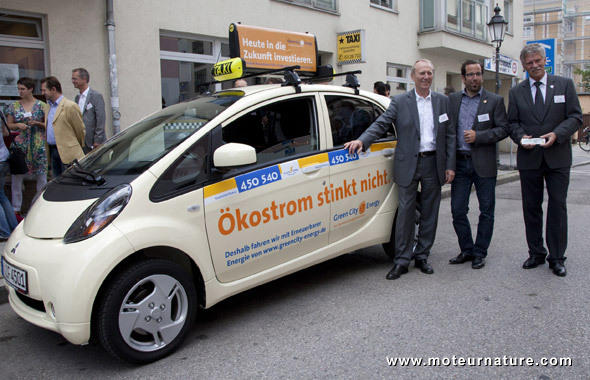 Not belonging to a self-employed individual, this taxicab belongs to IsarFunk, Munich’s taxi company, which will provide several drivers to make an electric Mitsubishi i-MiEV available 7 days a week. This small car will be waiting for customers at Munich’s central station, though I doubt it will be a satisfying ride for people with lots of luggage.